When JAXA launched Hitomi in February of this year, scientists were almost giddy over the possibilities of what the black hole monitoring satellite might tell us about the mysteries of the universe. It was only up there a month when something went wrong. A series of unfortunate events caused by both human errors and software flaws sent the satellite spinning out of control. Despite attempts to regain that control, Hitomi continued to spin and throw debris into space. Eventually, JAXA declared that the $273 million satellite was beyond recovery. When Hitomi died, though, researchers also announced that they’d managed to scrape just a little bit of data from the satellite and would be detailing it in upcoming papers. The latest is a new paper in Nature, which shows Hitomi’s final observation. It has some fascinating implications for what we know about the role of black holes in galaxy formation. Researchers expected to see teeming activity in the centre of the cluster, but Hitomi’s final x-ray observations showed very little. But the finding isn’t just a surprising oasis of calm in a turbulent galaxy. It also gives us a fascinating glimpse into just what role black holes play in how galaxies do—or don’t—form. Of course, the find also underscores how little we still know about the role of black holes in galaxy formation—and how many possibilities were closed with the loss of Hitomi. The loss is even bigger because Hitomi marked what researchers hoped would be the end of a long-standing struggle to finally stick an x-ray microcalorimeter—a device used to take incredibly precise measurements of the energy in x-rays—into space. The findings in today’s study were based on just a very small sample of data researchers were able to get from that microcalorimeter before it was lost, and it already has them speculating over what could have been. Before Hitomi, two separate missions which would have sent a microcalorimeter into space ended in strange accidents. In 2000, a rocket mission that would have sent the first one into space exploded upon launch. In 2005, a microcalorimeter actually made it into space, but was destroyed by a coolant leak. 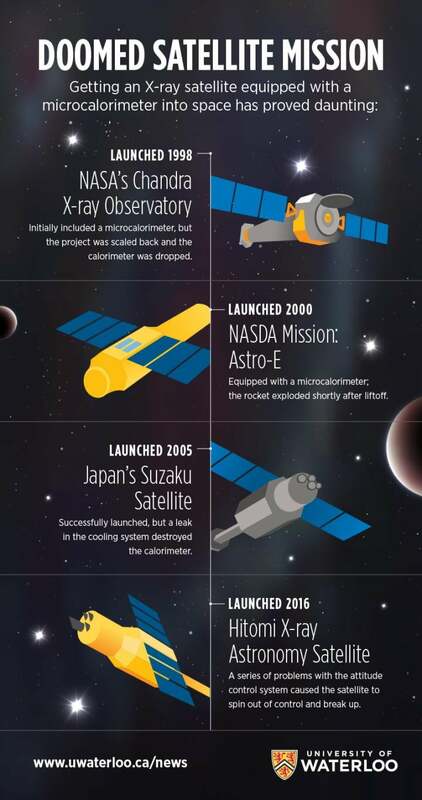 It wasn’t until 2016 with Hitomi that a microcalorimeter finally was launched and started taking measurements—only to be lost along with the entire satellite shortly after. If a microcalorimeter can make it back into space, it could pick up unravelling the mysteries that Hitomi left unsolved—and, perhaps, open the door to some some entirely new mysteries for us to contemplate.